Super Primer is. . .
A premium concrete pumping aide which will replace high priced grout, primer slurries, or bagged cement primers. Super Primer is compatible with all conventional concrete materials. Super Primer is environmentally safe and contains no bentonites, cementitious materials, soaps or air entraining agents. Super Primer is Smart. . .
Packaged conveniently in 5 fl. oz. (148ml) bottles with 2 treatments per bottle. Super Primer mixes significantly quicker than powders. 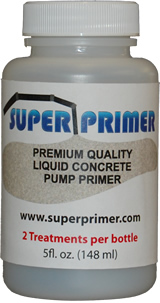 Super Primer when used as directed, reduces friction and line pressure resulting in ease of pumping and increased range. When using Super Primer, less horsepower is required to pump resulting in less wear on equipment and fuel savings. Super Primer Saves. . . Cutting costs, without compromising on quality, is the goal of any company especially during this current economy. Super Primer delivers both. At a 50% savings over other liquid primers, there is no question that Super Primer is the primer for your company. We are so confident that if your field technicians were given the opportunity to try Super Primer, you will become a permanent customer. To get you started, we would like to send your company a 5 fl. oz. (148ml) bottle (2 treatments per bottle) at no cost. Click the “Order Free Sample” button above to place your order now.